WHY? Sewol: A First World Tragedy with a Third World Reaction – Links to articles and blog posts about the glorious game of golf! 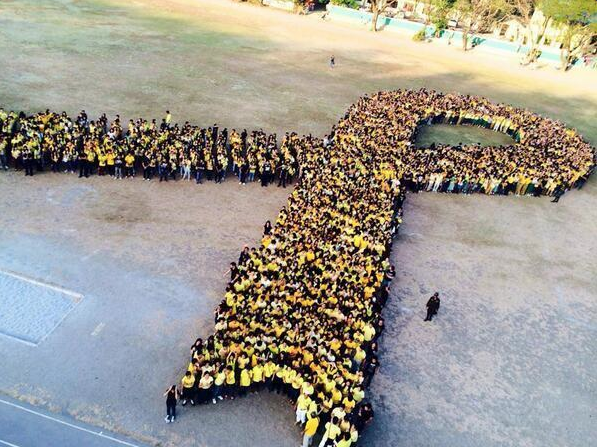 There are simply no suitable words to express how much the Sewol ferry tragedy has affected so many people both here in South Korea and all across the globe. The unthinkable impact this devastating accident has had on all the families and friends involved is possibly so severe, that coming to terms with this awful event may be something they will never achieve. And who would dare to blame them? This catastrophic incident could have been avoided if the proper procedures were put in place. As an expatriate who has been living here for over four years, one question that always crosses my mind (and the minds of many other foreigners here) is ‘why Korea’? From the simple everyday individual acts of bemusement, to national customs that seem quite difficult to fathom, this question never seems to be far from my thoughts. It must be clarified that in no way am I degrading local customs/traditions, in fact it is quite the opposite. Korea is a great country, a country that may leave you perplexed initially, but as time passes, it is a country that most grow to love and the customs here are not only accepted, but embraced for the most part. After all, we are the minority group here, who have been welcomed into this country with open arms and we should never forget that. On April 16, the lack of appropriate action taken to save hundreds of young lives on the Sewol ferry has raised that question ‘why’ again, but this time it really does need to be addressed in a much more serious manner. 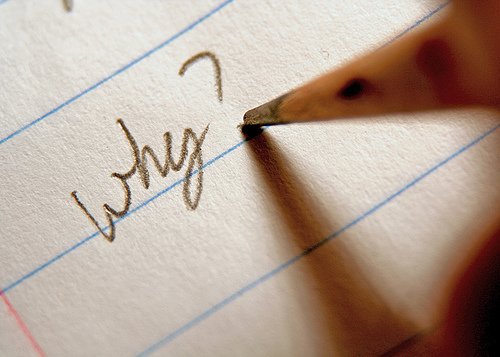 There are so many ‘whys’ that have emerged from this tragedy already and as the investigation continues, it is inevitable that even more questions will arise. Why did the Sewol sink? Why were passengers ordered to stay indoors as the ship was clearly sinking? Why did the captain and crew flee before the passengers? Why were there no safety procedures performed before the ship set sail? Why was there only two lifeboats deployed? Why did the passengers listen to the orders? Why did the government act in such an incompetent way in the aftermath of the tragedy? 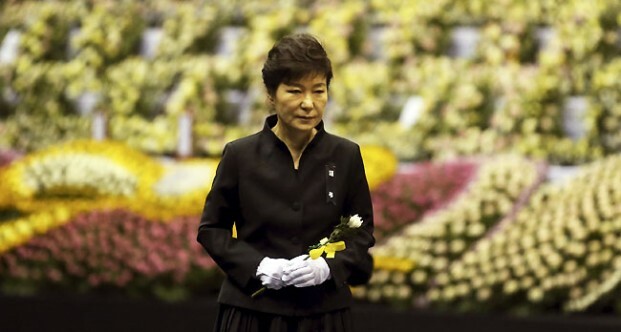 Why did President Park Geun Hye publicise her opinions on the Sewol captain and crew ruining any chance they have of a fair trial? Why were there so many conflicting reports in the media? Why did it take two weeks to deploy a diving bell? 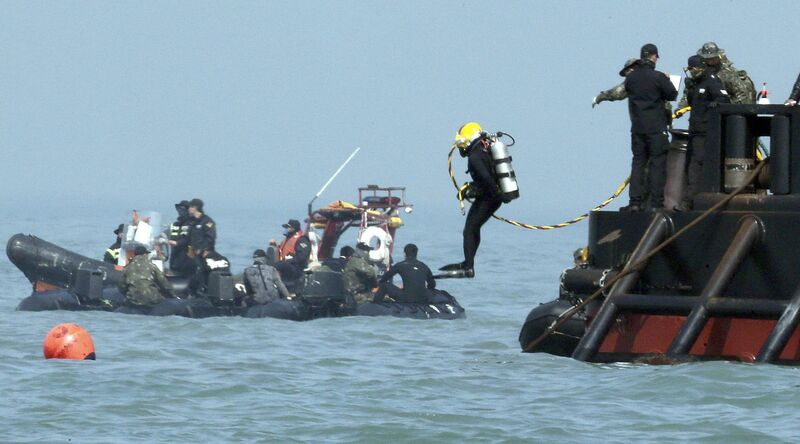 Why were some divers stopped from joining the rescue mission? Why is there a lack of adequate international assistance? Why is the investigation going to take up to six months to draw these conclusions? Why did so many young and innocent lives have to suffer? 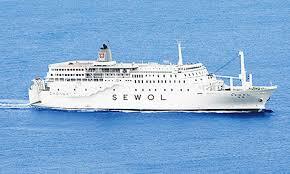 Simply put, the Sewol ferry tragedy; why did it happen? These are just some of the questions that need to be answered. Unsurprisingly, most fingers of blame are being pointed at the captain and his crew. 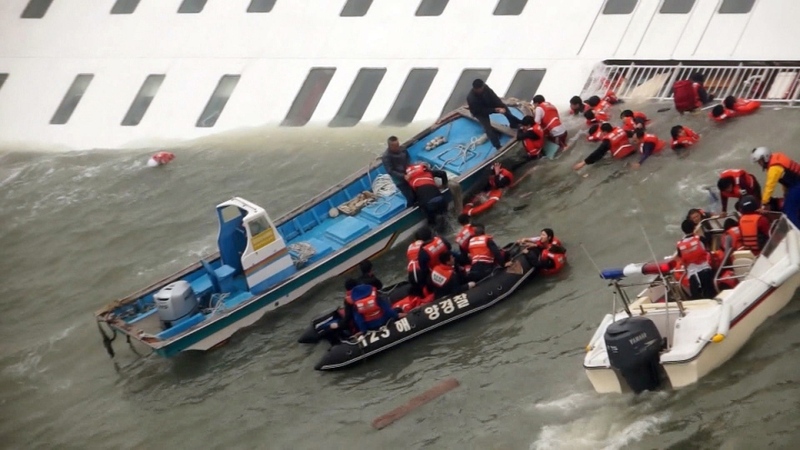 The very fact that they survived while over 300 passengers aboard the Sewol lost their lives, shows that they failed terribly in their duties to protect everyone on board. Their selfish behavior is one of the main reasons why so many lives were lost; this is a stone cold fact. The shameful scenes of the captain being rescued from the ship, as the passengers remained helpless indoors; waiting for his guidance is one that will live on in many peoples’ minds. Once again, why was he not in his uniform?To avoid being recognised it would seem. How dare he think that his life is more important than that of hundreds of school children, but not just them, all the passengers on the ship, young or old, rich or poor, male or female, it doesn’t matter; all these lives should have been given priority by the crew during the rescue mission. The captain and the crew will be punished, but there is not a punishment severe enough to justify their cowardly and selfish reaction. Focusing solely on the incompetence of the captain and his crew would be naïve. The Korean Government has to be held accountable also. The lenient approach towards safety procedures here in Korea has come into question in the past, yet it looks like the loss of over 300 lives is what it is going to take before the government orders the necessary actions to ensure that public safety here is enhanced to a level it should have been at decades ago. It is all too little, too late. The Korean economy may be one of the strongest in the world, but there are still so many flaws with the country’s leadership structure. There is a sense amongst some people that Korea still remains a partly underdeveloped nation, that needs a lot more guidance from the western world. Perhaps this statement is a touch too harsh, but judging by the way in which this tragedy was handled, it certainly poses the question as to how much Korea has actually advanced in recent decades. My thoughts exactly. Such a sad story. So avoidable. So many why’s. SUCH an awful title. Good article, but as a developed worlder I must urge you to change the title. The so-called ‘third world’ is sometimes unable to compete in development with economies like Korea’s BECAUSE they are more stringent about regulation. This article makes so many interesting points about the government and crew, but the title about the third world and the final paragraph referencing the fact that Korea is “underdeveloped” is just going off on a tangent. And inaccurate. I’d like to know what kind of expert you are to make so many opinions…. or have you merely gathered your information from the media and gossip? Yes this is a very traumatising tragedy which is why most people will not confront your opinions out of emotion. I advise you against calling other people cowards and blaming them for the deaths. No one wanted this to happen – not even the crew. No one!! It is obvious that there were no drills taken place or emergency training put in place in this situation. Now let me give you a little lesson in human behaviour and social constructionalism. Let me shed some light on a different opinion. I want you to imagine that you are a young boy who wanted to become a captain of a ship. You did all the training and then found the job. However no-one gave you proper training for emergency situations. You trusted the system of education to teach you everything you needed to know, but it didn’t. The only emergency training you knew existed in a manual – but no one gave you an opportunity to learn it or to practise it. So you continue to work hard at your job of driving the ship and following all instructions that are given to you by your superiors. You trusted your training – however you were completely naive to the nature of emergency situations because you have not been trained properly or rehearsed. Therefore you were not acting in negligence if you were not aware of the exact nature of situations yourself. You were simply doing your job in the way you had been trained to do. In other words you were qualified to operate the ship, yet uneducated and naive of what to do in this type of emergency. Let’s continue… Human behaviour consists of many natural and somewhat unorthodox reactions in times of stress. This is why many world wide militaries knows what to do in many emergency situations – it is because they practise, over and over again so that their people don’t act negatively in times of stress. Imagine you are driving along and a car suddenly loses control and comes across your path. One normal person probably won’t avoid the accident, but a NASCAR driver may. Why? Because one is practised and rehearsed in these times of stress and situations. It doesn’t matter whether these events are short or fast. Trained ambulance officers etc, are calm on accident scenes because they are familiar scenes to them. Other people panic and can be out of control with not knowing what to do. We react in relation to what our body and mind has been previously exposed to. Now back to the crew. In the state of an emergency, where people are unrehearsed and uneducated, panic can easily set in. This can be individual for different people and can often result in a FIGHT or FLIGHT response as an individual survival mechanism. It is quite possible that the captain and crew fled in panic. They DID NOT KNOW WHAT TO DO! This does not make them negligent if they are uneducated and unrehearsed in the first place. As I said previously, their reactions are in relation to what their body and mind has previously experienced. This is what I believe has taken place. This whole situation has been a reaction of panic due to the exposure of a new and unknown situation to uneducated personnel. The tragic deaths of these people have been a result of a wholistic system failure. Nobody wanted this to happen. I am not saying that the crew was not at fault, but I am definitely not saying that they were. Human nature always wants to point the finger and seek someone to blame. I am asking people to consider that this is a systematic fault that has developed over time. Lets stop pointing the finger and merge toward improving system with a focus of prevention. Please stop pointing the finger at individuals. Have you also considered them and their families. They also have to live with themselves knowing that they did not save or protect so many lives. Have you considered they are also victims of this tragedy. They were put into an unfamiliar situation where they just didn’t know what to do. I pray for this nation, the families of the lost, the lives lost, and I also pray for the lives of ALL the people who have to live on from this tragic event. However can we please stop pointing the finger of blame and learn from the situation so that practices can be improve in order to prevent this kind of thing from ever happening again. I do hope you are able to consider this way of thinking and change aspects of blame and fault in your article. I am also deeply affected by this tragedy. No, I’m not an expert. I never said I was. I’m entitled to my opinion, as you are to yours. Mistakes were made and cannot be overlooked. If it was up to me this whole investigation would be done behind closed doors, away from the public eye, but unfortunately this will never be the case and differing opinions will always emerge from this. Thank you for your feedback. Hi there. You mentioned that it was because the captain and crew panicked because of an unfamiliar situation hence it is not right to just point fingers at them. However, it is just because they are the captain and crew of the ship, they have a duty towards their passengers. How about the young crew who lost her life because she gave life jackets to the passengers and told them the crew will be the last to leave after all the passengers have been rescued? She was only 22 and a cafeteria worker at that. How did she get this idea? I don’t think it’s being taught anywhere on manuals. And I doubt she has encountered any major and serious accidents in her short life to draw any experience from it. However, it is different for the captain. He has over 30 years of experience. I would expect him to know better. The whole accident is a culmination of various factors. True. But bad judgement, the audacity of the captain to let an inexperienced 3rd mate handle the ship, poor response by the coastguard etc, you cannot help but feel that all these could have been avoided or at the very least reduced the number of casualties. If only. Very well said Jinnous. They failed in their duties and will be punished accordingly. Three things count here,the captain,the rescue and the government. They all failed dismally. A captain becomes a captain not only by qualification but experience too. So when this captain was hired in 2006,experience counted. 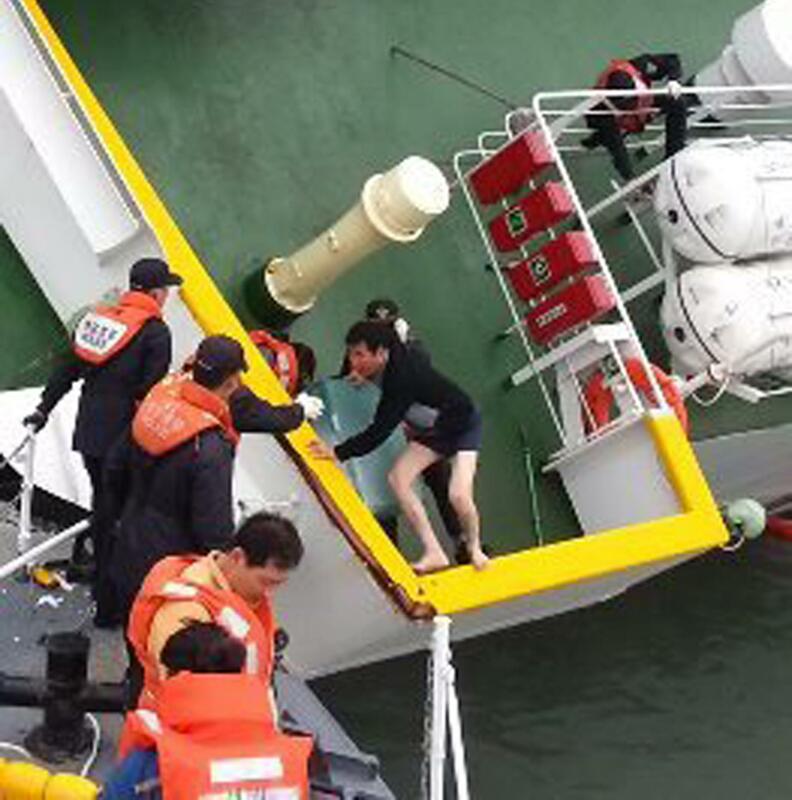 Unfortunately he took everything lightly when the ship started capsizing,the rescue team that received the distressed call also took the scene lightly. The government didn’t even have any submarines around. Yes, captain is entirely at fault. However, Korea’s culture focuses greatly on obedience. That is why students and many others remained indoors as they were told. And I do not like the statement ‘underdeveloped nation’. This disaster does not entirely reflect how leadership qualities in Korea is like, yes maybe it does to a certain extent, but that doesn’t show how developed the country is. I just believe that Koreas economy has developed at such a rapid pace, its leadership structure is lagging behind a little and not on a par with the country’s progression. Thank you for your feedback. Hi. I have been reading that it is Korea’s culture of obedience that lead to the students’ deaths. I can’t help but disagree. Faced in an unfamiliar situation, the first instinct is to obey the captain’s instructions, because he would know what would be the best way to survive in this situation. This does not apply to only Korea, but anywhere in the world. in all sorts of situations. That is why we place our trust and lives in the hands of the professionals. We trust them for guidance because we are not experts. Korea has developed extensively in the last 50 years, and I guess, at the expense of it’s people. If we backtracked how the accident happened, it could very well point to the fact that there was some corruption along the way. I’m no expert. Just giving my two cents’. ← Another First Time Winner Possible in Singapore? No.